College posters are basic dorm essentials. Every college student goes to college with a dorm poster or two in their dorm essentials. And why not! They're cheap dorm supplies and you get to display your personality and interests! While college posters may be in every college dorm room, the same college poster will not be. Which is good because you want a unique dorm room with one of a kind dorm essentials in it! Make your college dorm room unique with our Life Imitates Art Poster! 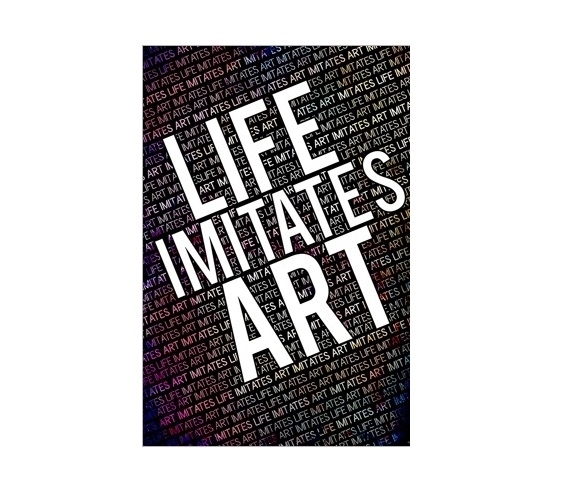 Our Life Imitates Art College Poster features the words "Life Imitates Art" repeatedly across the black backdrop. What is unique and eye catching about this dorm essentials product are the colors of the phrase. The words are in large print in white for a pop of bold style and the smaller phrases are multi-colored in shades of pink and blue. This simple design of this college supplies item will blend well with any color dorm room decor for style that pops. You can place this dorm essentials item on the back of your dorm room door to add style to it or you can place it on your dorm room walls or college closet doors. Add basic dorm supplies like our Life Imitates Art College Poster that will make your college dorm room feel like a home away from home and add to your college room decor.